In the Texan climate, it is not quite recommended to use chemicals and fertilizers in summer to fend off weeds. It is quite forbidden if you care for your lawn and landscape, as many such substances can burn the soil and damage the lawn. Weed pulling is one idea, but let’s face it, with our summer temperatures it is hard and unhealthy to spend your days pulling weeds and trying to keep them at bay. There are, however, some other means of keeping weeds off your property while you stay back, relax, and enjoy your lush and gorgeous landscape thriving before your eyes. With almost 15 years of experience in lawn care and organic landscape management, we are proud to say that today our fertilization & weed control Midcities TX services are the best money can buy. 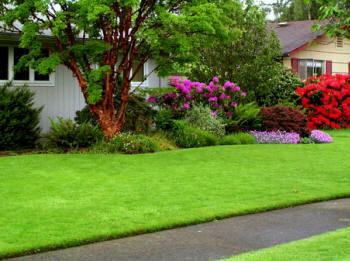 In comparison to other contractors, we take our job very seriously and we treat your lawn just as if it is ours. This is why we don’t just come over to your house and spray the lawn with some substances, recommending you to hope for the best. On the contrary, we consider your lawn a year-round project that needs constant management and adjustments. We always perform a detailed property assessment before anything else: we learn about the soil’s pH, we evaluate the vegetation you grow on the property, we assess the micro-ecosystem on the property, and we also inspect pest activity. All these tasks help us understand better the fertilization & weed control needs of your landscape. We offer integrated services as fertilization & weed control are less efficient in the lack of proper disease and fungus control, insect and grub control, core aeration and high-quality weed control products’ use. Just so you know our innovative and comprehensive lawn program uses bio-based products in addition to traditional lawn products because we want you to have a vibrant, green, healthy lawn completely free from weeds. We will implement tailored, customized 7-steps fertilization & weed control program: we will treat your lawn every 5-7 weeks throughout the year including pre-emergent weed prevention, fertilization & weed control. We also include follow-up sessions and regular verification visits; they help us understand how things work and make the necessary adjustments to ensure the thriving of your lawn in any conditions. If you need our superior products to rejuvenate the soil and strengthen your lawn’s root system and wish for a hassle-free year-round fertilization & weed control Midcities program, give us a free call right now!